Massive spoilers in this one. If you haven’t seen it yet, go watch the episode first. 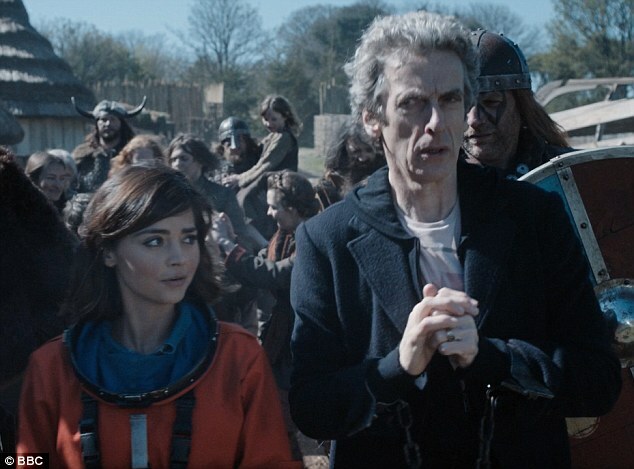 I’m so happy that we’ve finally got a story where the Doctor and Clara actually have scenes TOGETHER. I was beginning to despair at the lack of direct interaction between the two. And yes, they basically an old married couple and I love it. Whether you accept it as platonic or maybe even sail aboard the S.S. Whouffaldi, their dynamic is everything and I never want it to end. I know logically that day is coming very soon, but that doesn’t mean I have to be okay with it. I like the look of The Mire. Sort of an industrial answer to the Viyrans. I almost wish they’d been a little more menacing and hadn’t just been a somewhat lamely used plot device to get to the main story, which is clearly about Ashildr. I was NOT a fan of “Odin”. Being a fan of both Norse mythology and Marvel, I found him extremely disappointing. Like some said of the Arthurian legend that was played with and completely wasted in the plot of Under the Lake/Before the Flood, I felt the same is true with the use of the Norse god in The Girl Who Died. Especially considering that River once mentioned a picnic in Asgard. I want the real thing…so to speak. The “solution” is silly. The Doctor has basically resorted to cyberbullying, which I’m sure is sounding alarm bells for some, but I just think it’s ridiculous. Maisie Williams is a wonderful actress and I think I liked Ashildr, but I feel like there wasn’t enough to base a real opinion on. I’m hoping that, now that such an astonishingly huge thing has happened to her, it will be easier to form an opinion of the character. And that they give her more to do because the part seems wasted on an actress of her calibre so far. I also want it known that I say this without the bias of fandom because I’ve never seen Game of Thrones. I used to feel like more things happened in two parters. Like there were actual things that happened in both parts of the story. So far this series, each first half is more set up for part two than it is anything else. This time, the story felt fairly self-contained, but I still didn’t walk away from it thinking that a whole lot had happened other than set up for next time. With one exception. The emotional center of this story (so far) has two parts for me. The obvious bit that everyone talking about is the Doctor FINALLY remembering why he chose that face and where it came from. The Doctor remembers who he is supposed to be and that even if he can’t create a “tidal wave” he can still save someone. Thus—apparently—fulfilling the prophecy he was running from by creating a Hybrid. Which presumably has created a tidal wave that will backfire somehow in the next part. Is this the Hybrid that Davros spoke about in the series opener? It seems strange to have that arc come to fruition so early on, but anything is possible. The real epicenter for me, however, was immediately before the Doctor’s big revelation. The Doctor talking about how losing Clara will inevitably hurt him was heartbreaking. Ever since we first met the Doctor, he has been losing people over and over and over and over again. It’s no secret that it destroys him at least a little bit nearly every time it happens. And now not only do we have an incarnation of the Doctor that is perhaps more intense than others, but we also have a companion who is 1) a “first face this face saw” and 2) someone who has been a part of his entire timeline (in one form or another) and saved him again and again and again and again. No matter what your feelings are about Clara Oswald, it’s hard to deny that–barring any major plot twist–losing her will hurt him very, very deeply. After such a major reveal, I’m anxious to see what’s in store next. What did you think of this story (so far)? Did the Doctor’s revelation work for you? Any guesses as to what’s going to happen with Ashildr? We’d love to know what you think!